You have a rare hour of free time, and you want to finish that next step in the sewing project. It will be okay if you skip doing something just this one time, right? One small decision can mean a lot of rework later. Slow down and enjoy the process. Keep these points in mind when you are working on your next project to make it more enjoyable and create a more beautiful piece. First things first: you need to wash your fabric before you start any work. Otherwise, it might shrink and no longer match the required measurements. Try to launder the material in the same way you intend to wash the finished piece. For instance, don’t soak the fabric in cold water if you know you will clean it in warm water once you’ve finished it. Yes, ink pens make a nice dark line which is easier to see when you are cutting. However, that also means it is easier to know if you don’t cut it all off. Or worse, the ink can run and stain the garment when you rewash it. Do yourself a favor and use chalk or a pencil. Remove the temptation by not having any pens nearby when you work on a project. Where do you store your thread? 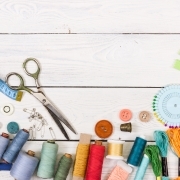 If you keep it on the table to make it easier to use, it is likely gathering lint and dust that will leave traces on your project and possibly clog the sewing machine. Project items like fabric and patterns should be in a closed container to keep them clean. Another one of the bad sewing habits is to introduce dirt into your project by beginning work without washing your hands. Lotion can leave a greasy residue and clay can leave smudges. Also, you should keep food and drinks away from the project area, or at least use cups with lids. Sewing scissors need to remain sharp to make sure you can cut a clean, straight line. The logic also goes for changing rotary blades if that is your preferred method. If you use scissors on anything besides fabric, they’ll become dull. Keep a pair that is devoted to sewing. Likewise, make sure you are sharpening or replacing scissors that have become dull. 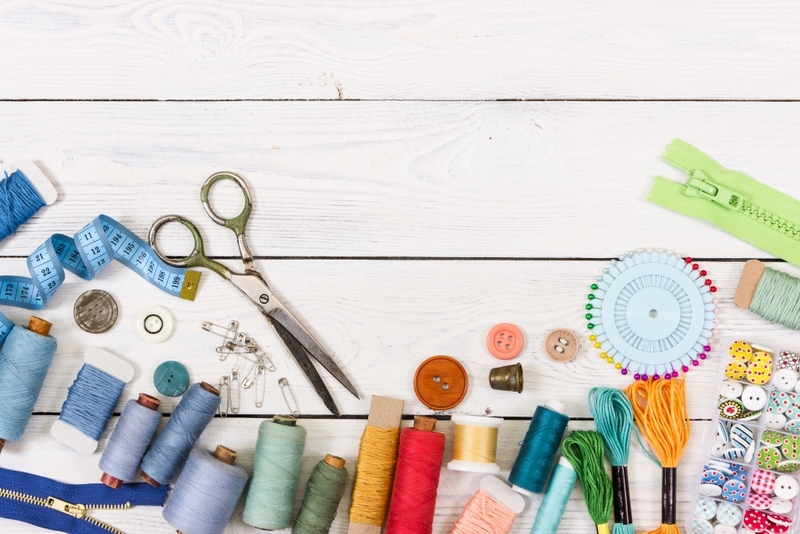 One of the bad sewing habits that many people don’t recognize is reusing the same needle. A new needle will be nice and sharp and won’t skip or bend. You can downgrade a needle to a quick button or mending project, but you should make sure to have a new one in the sewing machine. You might think that only babies swallow things that they aren’t supposed to, but it isn’t hard to take a quick intake of breath and eat the tiny thing in your mouth. The sharp, pointed object can cause damage to a lung or digestive organ. It just isn’t worth the risk. Keep a pin cushion out when you work. Besides, they are a pretty and fun way to liven up the workspace. One of the best parts of any project is imagining how it will look. Standing in the store and thinking of the possibilities can lead to overbuying. It is like going grocery shopping without a list. Before you leave home, enumerate the items that you need, including needles, marking pencils, or new rotary blades. By organizing your workspace, you will be able to find what you need and avoid buying duplicates. The real benefit of this is that you will have money left to purchase items for another project! Sewing machines need periodic maintenance just like everything else. Make sure that there is no dust built up and that the items are working correctly. A hot machine with lint and grease buildup can start a fire, or it can jam the parts and stop working altogether. Also, make sure to unthread correctly. Clip the thread and pull its end through the needle instead of removing the spool and pulling the thread back through the machine. It’s a practice that can damage the tension disks. Depending on how much you use your device, you might want to schedule reminders in your calendar for regular tune-ups with a professional. Think of it as another regular appointment, like oil changes for your car. You don’t press the seams to remove wrinkles in the fabric but rather to start creating the desired shape of the finished product. The material will begin to take on a shape memory, and the stitches will settle into the desired outline, creating a more finished look to your piece. Seams will lie flat, making it easier to mate up new pieces correctly. Sewers should spend more time pressing than sewing. If you found these suggestions and details useful and you would like to explore more options regarding sewing machines, please contact us. At The Inspired Sewist, we specialize in everything sewists need to bring their projects to life. Whether you’ve been a needle expert for years or just starting, we’d love to help you create what’s on your heart. Contact us for more information!